Tamilnadu in the far South of India is a land where traditions and culture live in harmony and is truly a living tradition of music and dance! Home to many natural resources, temples of Dravidian architecture, hill stations, beach resorts and many religious pilgrimage sites, this exciting region will enchant you! 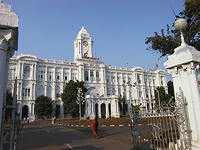 Upon arrival in Chennai, meet our representative who’ll assist you in a smooth transfer to the hotel for overnight stay. India - a land that evokes flights of imagination and curiosity, a canvas of spectacle and colour. Ruled by a succession of native kingdoms, often overrun and inhabited by invading armies of Central Asian origin, followed by the Mughals and finally the British, transformation has been never ending. A profusion of races and cultures, and the magnitude of their legacies, are evident today. Morning tour of Chennai including visits to: Fort St George and St Mary’s Church, built by the British in the 1600s; Chennai Museum, which houses some of the finest 10th to 13th-century bronze sculpture in India; Kapaleeshwara Temple, a classic example of Dravidian architecture, marked by a 36m goparum (gateway) tower adorned with detailed figures and inscriptions dating from 1250; and Kalakshetra Dance School, dedicated to the preservation of traditional Bharatanatyam dance and Gandharvaveda music. Overnight at hotel. After breakfast, leave for Kanchipuram by road. 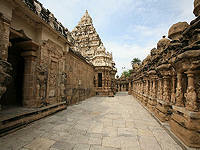 Around 70 km westwards of Mahabalipuram, Kanchipuram is referred to as one of the seven sacred cities of Hinduism. The Chola capital during the 2nd century, Kanchipuram today is an important place where people come to gain knowledge about Jainism, Hinduism and Buddhism. You may visit the city’s popular temples such as Kamakshi Amman temple, Ekambareswarar temple and so on. Also visit the silk weavers of the city, residing here from past four centuries. Thereafter, continue towards Mahabalipuram. On arrival, complete the check-in formalities at the hotel. Overnight at hotel. Today we take a tour of Mahabalipuram, the ancient port of the Pallava rulers. During their reign, they constructed a number of architectural marvels such as caves, sculptural panels, temples and Monolithic rathas. 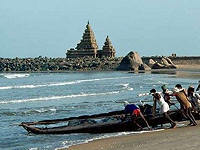 These include Krishna Mandapam, the Shore Temple and the Five Rathas. Krishna Mandapam is dedicated to Lord Krishna, and is the world’s largest cave-cut Hindu temple. The walls of this temple consist of several figures, including those of Lord Krishna, humans, birds and demi-gods. The Shore temple dates back to the 8th century and is one of the finest examples of the Dravidian style of architecture. Finally, the Five (Paanch) Rathas, also called the Paandava Rathas, is a group of 5 monolithic temples, each erected in a different architecture style. The afternoon is free for your own activities or relaxing on the beach. Overnight at hotel. After breakfast, drive to Pondicherry, visiting Auroville en-route. Auroville is a rural community near Pondicherry and is an experimental township founded in 1968 by Mirra Alfassa (known as "The Mother") and designed by architect Roger Anger. As stated in Alfassa's first public message about the township, "Auroville is meant to be a universal town where men and women of all countries are able to live in peace and progressive harmony, above all creeds, all politics and all nationalities. The purpose of Auroville is to realize human unity." 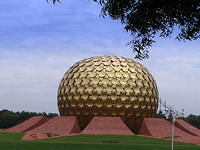 At its heart is Matrimandir, a golden sphere which is the Spiritual center of Auroville. Later drive to Pondicherry and check-in at hotel. You can take a leisurely stroll around the tranquil, broad tree-lined boulevards and avenues of the French Quarter of Pondicherry where colonial heritage villas line straight, clean streets. 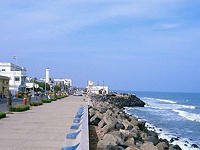 After breakfast, we take a sightseeing tour of Pondicherry. The attractions that you visit today include the Sacred Heart Church, the Rai Niwas and Sri Aurobindo Ashram, founded by Sri Aurobindo, in the year 1926. This spiritual community is flocked to by a huge number of visitors all round the year. Apart from being a religious site, Basilica of the Sacred Heart of Jesus is an oriental specimen of the Gothic style of architecture. End the day with an early evening seaside promenade (together with half the town) to enjoy the sunset and the cooling breeze blowing off the sea. Overnight at hotel. After a refreshing break at Pondicherry, we are back on our trail of temples and world heritage sites. After breakfast, drive to Chidambaram (65 km, 2 hrs). The east passageway of this temple is carved with 108 sacred postures which inspired the classical dance form called Bharthanatyam. This is the only temple with a brass idol where Shiva is worshiped in this cosmic dancer form. The architecture is Chola style. Afterwards, drive on to Kumbakonam and visit the 12th century Chola temple at Tribhuvanam. Finally a short drive takes us to the town of Kumbakonam. Enjoy a lovely breakfast at your hotel then start your journey to Trichy via Tanjore. Welcome to the ancient capital of the Chola Kings and important centre of South Indian art. The Tanjore school of painting is famous for depicting Lord Krishna in white. Explore the Brihadishwara Temple: ‘Big temple’ with the largest temple tower. This famous Shiva temple is also part of the great living Chola temples heritage site. The temple houses one of Asia’s largest stone Nandi (bull) statues. Curiously the temple architecture is such that at any time of the day, it never creates a shadow on the ground. Among the most celebrated architectural discoveries in Tamil Nadu, the Brihadeswara temple is a compelling sight. You could consider a quick shopping tour for Tanjore paintings, dancing dolls and musical instruments. Also consider a visit to the Palace Museum in Tanjore. After visiting Tanjore drive to Trichy (60 KM, 1.5 HRS) andcheck-in to your hotel. 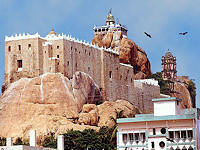 The Rockfort temple in Trichy has close to 600 steps to climb to reach the top. There are multiple shrines and caves along the way. The top will give you a beautiful aerial view of Trichy.You could visit a local market in town where you can enjoy the aromatic experience of spices, fruits and flowers are sold. Today we travel to one of the oldest continuously inhabited cities in the world, Madurai. After a relaxed breakfast and enjoying some time in your mansion, start journey to Madurai. (90KM, 2.5 HRS). Arrive Madurai and transfer to hotel. 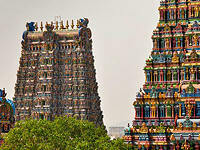 Later visit the Meenakshi temple - Leave the hotel for the temple by cycle rickshaws. At 9 PM, attend the night ceremony at the temple which takes place every evening when the temple bronze of Lord Shiva is carried to the bed chamber of Parvati. The procession is accompanied by religious prayer and temple music. Overnight at hotel. 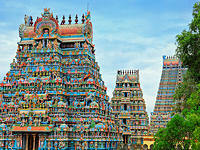 Today is for visiting the prime attractions of Madurai. Placed on the banks of Vidai River, this popular city of Southern India is around 2500 years old. Visit the splendid Meenakshi-Sundareswarar Temple or Meenakshi Amman Temple.This magnificent temple is dedicated to Goddess Parvati, the consort of Lord Shiva. While the Goddess is known as Meenakshi in this part of the country, the Lord is known as Sundareswarar. This magnificent temple has 14 gopurams. The afternoon is at leisure. Oovernight at hotel. Today you drive to Udhagamandalam (300 Kms/08 Hours), more commonly known as ‘Ooty’ a shortening of its anglicized name, Ottacamund. It is a scenic ex-British hill station in the state of Tamil Nadu. Sitting at an altitude of 2260m in the cool Nilgiri Hills. After your long drive enjoy a visit to the Botanical Gardens. Rest of day free at leisure and overnight at hotel. 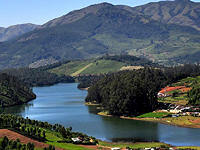 Today enjoy a full day guided sightseeing tour of Ooty. In Ooty, there are many reminders of the colonial legacy such as quaint single-storey stone cottages, Christian churches, leafy winding lanes, and private schools, English street names such as Charing Cross and Westbury Road and terraced botanical gardens. 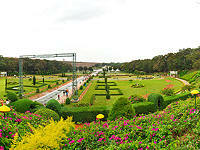 Ooty’s beautifully maintained Botanical Gardens were established in 1848 and include numerous mature species. If preferred we do can organise a small Trekking in Ooty; due to hilly terrain, walk could be on steep roads at times please let us know a time of booking if you would prefer this option. Overnight at hotel. After breakfast check out from hotel & drive to Mysore (125 KIms/03 Hours), on arrival check in at hotel. Mysore, the abode of untold grandeur and glory. Mysore, the capital city of the Wodeyars has always enchanted its admirers with its quaint charm, rich heritage, magnificent palaces, beautifully laid-out gardens, imposing buildings, shady avenues and sacred temples. There's an old world charm about the city that reaches out and leaves no one untouched. 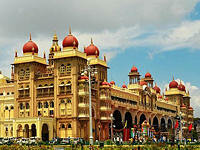 Mysore is one of the major cities of Karnataka. Today, it is a vibrant city teeming with tourists and visitors. It is known the world over for its exotic sandalwood and rich silks. 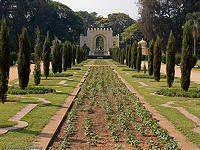 Its grand and imposing palaces, majestic temples, gardens leave an ever-lasting impression on the visitor. In the afternoon, take a sightseeing tour of Mysore, including Tipu Sultan's Summer Palace (Srirangpatnam), the summer residence of Tipu Sultan in Mysore till his death in the year 1799; Brindavan Gardens, a show garden that has a beautiful botanical park, full of exciting fountains and the Mysore Palace, within the old fort, completed in 1912 for the Regent of Mysore by the British architect, Henry Irwin. This morning drive to Bangalore to board connecting flight for return journey. Accommodation with meals as shown (B).